Myofascial tissue is the connective tissue of the body. It is a three dimensional web and connects everything. It is just under the skin, surrounds muscles, blood vessels,organs, brain and spinal cord. It is elastic, slippery and very strong. It simply holds us together. Fascia is lubricated between each layer which allows easy movement. When fascia becomes restricted it becomes like glue restricting ease of movement. Injury, inflammation, poor postural habits, lack of use can lead to fascia restrictions. 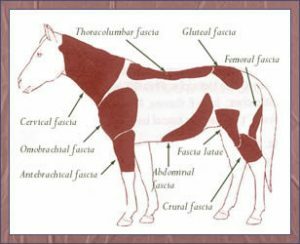 With these restrictions the horse cannot move easily and will compensate putting more stress on other joints and muscles causing more restrictions and poor circulation that can create improper muscle memory. Myofascial release techniques will allow the body to regain proper movement and circulation. Once this is accomplished it may be necessary to retrain muscle movements to correct muscle memory. to do. Doris is truly gifted and an inspiration. I am truly honored to know her and continue learning from her. Ruth Mitchell-Golladay is another great teacher that I had the opportunity to learn Myofascial release techniques from. I thoroughly enjoyed her course.